Championship of Ukraine in Nikolaew passed with strong winds up to gale in Black Sea waters. There were some yachts that lost their masts and some rescue operations was performed. 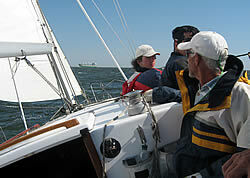 We had a new sails and very experiensed crew. So we won regatta and became a Champion of UKRAINE. We also won ECOREGATTA and BOSH CUP and we were presented a good prize. Again we are in Nikopol. A ZAE CUP took place here. We won regatta in strong winds, that was preferable for us. Traditional regatta Sailing season closing traditionally took place in the end of Ocrober . There was good sailing weather - E 3 -5. Such conditions is very suitable for our yacht Mriya. Our yacht liks to beat close haul in fresh air. We won all races and took first place. 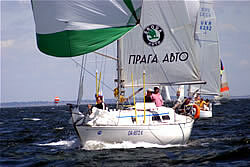 In October 20 - 21,2007, the Kherson sail federation held sailing races "The Day of the City". The yacht Mriya took part and her main competitor inside 1/2 tonn class was yacht Zephir. Yacht Mria had one first and 2 second finishes the first day of the regatta. The next day the wind increased up to SW Force 5 and the fleet made decision not to race any more. But yacht Mriya offered her competitor Zephir to continue and to complete two match-races. Zephir agreeded. The race route was set up and down the Dnieper river stream. Mriya had won the first race. There was a hard fight at the finish of the second race and yacht Zephir broke down the rules when she didn't get the way the leeward yacht Mriya. Zephir finished 3 seconds earlier than Mriya. The captain of Mriya entered a protest to committee. The commitee cancelled the second race at all. 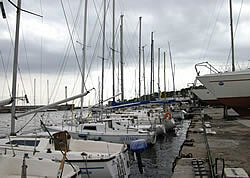 Yacht Mriya shared the first place with yacht Zephir. That was the second regatta Winfort Cup where yacht Mriya took part. The magnificant races in the Odessa bay gathered more than 40 yachts in several groups. It was the first time when the results were calculated accordingly to ORC Club rules and the forming of the groups was unusual. So 1/4 tonn yachts competed with 1/2 tonn ones. The weather was fresh, the wind Force 5 blew from S. It was good weather condition for yacht Mriya. She likes such conditions and she finished the first in each and every race. It garanteed overall the first place in the regatta for yacht Mriya. There were torn sails and we also had our genoa to be broken down. Fortunately the wind increased that moment and we could set the staysail and didn't loose our speed. Wonderful closing ceremony of the Cup took place in Itaka night club. All participants have remembered this event. 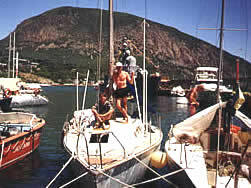 For the first place in the Winfort Cup regatta the crew of the yacht Mriya was prized with the 50 gr. gold bar and BOWMORE whiskey bottle. Early in spring 2006 the yacht Mriya was involved into the memorable event - The Cross Way of the Cherlobyl - to honor the 20th anniversary of the Chernobyl Catastrophe. The idea belonged to Narodny Deputat of Ukraine Boldyrev Yuri Alexandrovitch. Being started on April, 9 from Sevastopol, where the Saint Icons were taken aboard Mriya, the Cross Way went along the Black Sea, the Dnieper and artificial reservoirs up to Chernobyl and came there on April, 23 - the day of the catastrophe happened 20 years ago. 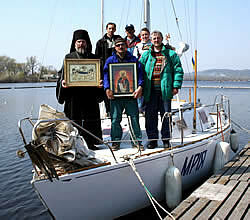 The Icons were escorted by priest Father Anatoli, the head - narodny deputat Boldyrev, cameraman Aleksey, movie-director Natalia and we - Sergey and Igor - the crew of yacht Mriya. There were liturgys in every city on our way. It wasn't easy way: the early spring, cold, heavy sea and hard schedule of our moving ( notice-there were no navigation aids on the river up to Cherkassy that time) made us reveal all our sea skills and self-restrain. The Cross Way was completed successfully. The Winfort Co. - the importer of drinks, organized an interesting regatta in the Odessa bay in early September. 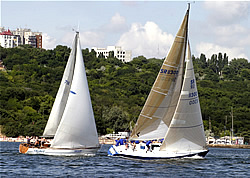 The series of the races on the triangle distance gathered large fleet of the yachts from Ukrainian citiessuch as Odessa, Nikolaev, Kherson, Zaporojie, Dnepropetrovsk. 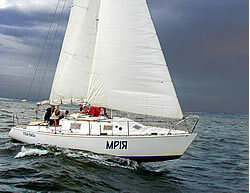 The yacht Mriya from Kherson took part in this regatta. Moreover, the prizes for winners were said would be valuable. That is the uncommon thing in our yachting! The calm weather conditions caused unexpected results of the races but yacht Mriya won the regatta in the hard fight inside 1/2 tonn group of 11 boats. That already was not a surprise for local yachtsmen. The ceremony of closing took place in the restaurant Riviera at the sea shore and impressed everybody. We have got 50 gr. gold bar as a prize! 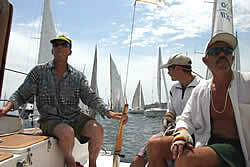 The annual traditional regatta Three Ports Cup was marked with numerous participants. A serious racer never looses the chance to get useful race experience. The interesting races' routes between ports - Odessa, Yuzhny, Illichevsk were alternated with races on the triangle distances off Odessa. The weather was not stable and wind changed its direction and force often. Of course, yacht Mria took part in regatta: that was the fourth Cup for us. The win came after hard fight in every race and the first place of yacht Mriya was the natural result of our rised skills. The prizes, to be true, weren't as good as before but interesting program of closing of the regatta in the night club Itaka with delicious food left nice memories. The National Championship of Ukraine was held in the middle of July, just after the Three Ports Cup. So entire fleet of the Port Cup's yachts took part in this event. There were numerous participants. Yacht Mriya took part as well. The crew and boat were prepared rather well. The championship went on not easy: frequent calms with their tiresome conditions, fogs in the 100-Miles race at night, postponed and cancelled races, etc... We weren't lucky generally: the 60-Miles race, which we had won with rate 1.5, was cancelled for umpire's fault; the other race, where we leaded, was cancelled via calm. Despite this yacht Mriya took the 2nd place among 1/2 tonn yachts. We enjoyed red caviar and wine at the closing party. The regularly scheduled Three Port Cup in Otrada, Odessa, gathered unprecedented amount of sailing yachts. It happened because immediately after this cup the championship of Ukraine started here, in Odessa. Everybody consider this regatta as wonderful possibility for training and to check their own skills and readiness to hard fight in the next races. Also it was important to look at competitors and correct own weakness. Yacht Mriay also arrived to take part. Our boat had good speed that time and crew worked well. Everything passed well and we won the First place in this regatta. The prizegiving and closing party took place in the restaurant Glechik and it was nice. We have not ever been in Zaporojie before. It was interesting to meet this region yachts (they visit us rarely) and compete with them. Besides, three races of the Championatship were included to the other event - The Satsky Cup and good prizes were promised. It was calm weather during all regatta. We knew neither local conditions nor fairways. The charts of the race area were handed to us a day before the first race started. We were late to finish 100 Miles race about 20 minutes and didn't get any points. Our overall result was: the Satsky Cup -the 3d place; the Championatship of Ukraine -the 4th place. I have to mention the nice yachtclub and its friendly administration. 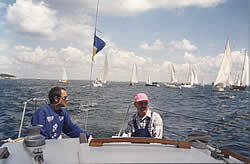 An interesting regatta is regularly carried out by Energodar yacht club. It is called The Cup of the Kakhovka Sea. A lot of yachts come here from Zaporojie, Nikopol, Kakhovka, Kherson. They are attracted here with nice quiet yacht club with heartily hosts and challenging waters area with fresh winds usually . We arrived aboard Mriya certainly. The winds up to Force 5 waited for the participants and races were not easy. Our group of 1/2 tonn yachts consisted of the boats from old rebuilt Dragon to K-30 and some new individually designed yachts. The fight was interesting. Yacht Mriya won the First place. After regatta's finish the organizer of the regatta arranged disco and bar for our community. On May, 30 we left for Crimea aboard Mriya to participate in the Cup of Crimea 2001. It was the second time we took part in this remarkable event. We hardly noticed the month of the event had passed being surrounded with the beautiful nature of Crimea and nice weather, involved into interesting regatta long legs with night navigation and welcome meetings. 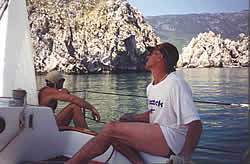 We had time to rest and visit famous places of Crimea where regatta had bearth: Sevastopol, Balaclava, Feodosia, Artec, Yalta. We won the First place (mostly in the light air) in the regatta where our main competitor was yacht Yunona (K-30) . Presently "Mriya" is a 9.0m bermuda sloop, 46 m² of sails area with top staysail, originally designed with LOA 8.30m. But the first sailing races showed that she had too narrow aft (accordingly to IOR requirement) and it decreased the ablsolute speed of the hull. I wanted to run faster so the upgrade of the aft part of the hull was recognized as necessary. And in late autumn, 1999, she was set for renovation. The aft part of the hull was cut and new plating and transom were settled. The speed increase has run up to about 0.5 knot when reach and she is able to surf on waves. 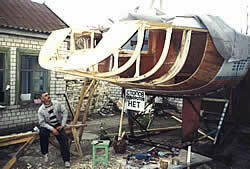 There is direct evidence of renovation : "Mriya" becomes the winner of many sailing races and National Championships. Our interest in this event is understood by any person who likes long-term sea sailing races, plus the amazing beauty of the Crimea peninsula. The list of ports of calls only impresses: Sevastopol, Balaklava, Feodosia, Artec, Laspi, Evpatoria. The weather was changeable... 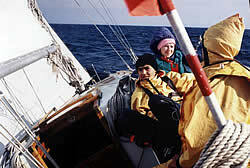 I remember, having put our course much off shore, we met night gale Force 7 on our leg to Feodosia, I was trying to catch our spinnaker pole which we nearly lost in the waves. Some of crew got seasick. The rich entertainment was offered by organizers in Feodosia: we visited Aivazovsky museum and A.Green museum as well. And we took part in the Day of City celebration in Yalta.. Great regatta! Thank you, Crimeans! 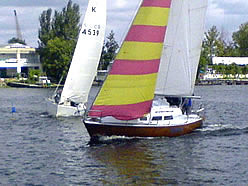 Yacht Mriya won the 2nd place. 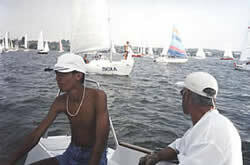 That was our first sea regatta. The race route wasn't easy: Odessa-Evpatoria-Sevastopol-Odessa. It demanded definite navigation skills and safe equipment control was serious. Our main competitor was yacht Sadko (K-30) with very experienced crew aboard. The first race night on leg to Evpatoria met us with fresh wind and dangers like drilling platforms. Further the weather calmed down and fleet fighted with calms. We won the first race to Evpatoria and lost two others, so yacht Mriya won the 2nd place. We liked that regatta which raised our skills up. We wish it became traditional.